KWS brings experience and technology into the custom fabrication of equipment designed to meet your specific needs. We provide Engineered Solutions. KWS maintains a large inventory of CEMA stock components that are available for immediate shipment. All KWS CEMA stock components are manufactured to CEMA Standards. Our staff of experienced sales and engineering personnel can help you design custom components and systems to fit your exact application. From CEMA standard components to complete systems, you can rely on KWS to exceed your expectations. As the industry leader, KWS designs and manufactures conveying equipment for every bulk material handling application. 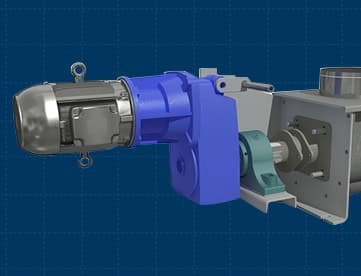 Working closely with our customers, we provide cost-effective solutions to bulk material handling applications for many markets and industries. Our large number of repeat customers shows our commitment to customer satisfaction. Our quality system ensures that your equipment is designed and manufactured to rigid specifications and validated by exceeding performance expectations. Case studies and testimonials for hundreds of conveying and processing applications. Step-by-step instructions to help you select the proper equipment for your process. Our online catalog has over 1,700 configurable CEMA standard component parts. Descriptive and dimensional information is provided for screw conveyor components. Our use of the latest 3D design technology reduces engineering cycle time and improves accuracy. As part of our ISO-9001 quality system, every piece of KWS equipment must pass a Factory Acceptance Test (FAT) as well as full dimensional verification before shipment. KWS Screw Conveyors are used to efficiently convey bulk materials from one process to another. Screw conveyors are very costeffective and require minimal maintenance to operate. KWS Screw Feeders are an accurate method of metering bulk materials. 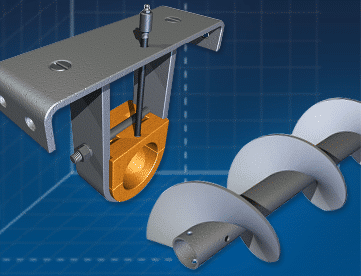 Screw feeders are designed to be flood-loaded and to meter bulk materials at fixed or variable rates. KWS Bucket Elevators are an efficient way to elevate bulk materials vertically. Bulk materials are loaded into each bucket and raised vertically to a designated height and discharge point. KWS Vertical Screw Conveyors efficiently elevate bulk materials at very steep inclines or completely vertical. The compact design allows for vertical screw conveyors to fit into almost any plant layout. KWS Hoppers, Bins and Silos efficiently store bulk materials for use in downstream processes. KWS Screw Feeders are used to meter bulk materials from a hopper, bin or silo. KWS Slide Gates are used to control the discharge of bulk materials. Slide Gates consist of a rigid frame with a slide plate that opens and closes by manual, pneumatic, electric or hydraulic means. For access to this content, please fill out the form below.